The health benefits of Taekwondo extend beyond the physical. No one will deny that martial arts are a great form of exercise in that the practice improves flexibility, stamina, and balance. However, Taekwondo has advantages to our mental health as well. Many children who have difficulty sitting still or focusing in a classroom setting benefit from Taekwondo. Take a look at this study by Bangor University that showed martial arts students had an improved attention span, greater alertness, more cognitive control than participants who did not train in martial arts. As you read the rest of this article, you will see the important concepts in Taekwondo. Strengthens the mind – Taekwondo requires mental discipline in that focus is required to learn the forms, reaction time, processing and hand-eye coordination. Enhances Character – Taekwondo training promotes character qualities such as cooperation, loyalty, integrity, perseverance, self-control, gratitude, etc. Strengthens the body – Kicking, punching, blocking, stretching, and training all lead to a higher level of fitness. In addition, it increases a sense of balance and coordination, and flexibility. Confidence booster – Just doing Taekwondo will encourage students to take control of their life and the progress experienced in class will make confidence soar. Self-defense – by learning self-defense students are better able to identify situations where defending against a physical assault might be necessary. Learning how to react in a scenario such as this could life-saving. Builds self-esteem – From the instructors to the classmates, students can count on the practice of Taekwondo to allow students to believe in themselves and their abilities. This builds self-esteem, which is very important during childhood. Leadership skills – Students are drilled on these tenets (principles): Honor, courtesy, integrity, perseverance, self-control, courage, humility, strength and knowledge. Adhering to these tenets in childhood will produce adults that have substantial leadership skills. Coping with defeat – Learning the ability to fail from time to time is another aspect of Taekwondo that can be beneficial to children (and adults!) As a parent it may be hard to watch, but so much is learned through coming in second, or third, or last. Life is not a series of wins, it's a journey of success and failure, picking yourself up and learning to get back on the mat and try again. Learning to lose with grace, congratulate your opponent, and move forward is a skill that will be valuable for a lifetime. So when looked at from this perspective, a loss can be turned into a win! Socialization skills – Sparring and other aspects of Taekwondo require that students interact with their peers as well as adult instructors. Children also learn how to deal with a bully and how not to BE a bully. Very important! Goal setting skills – As students move up in rank and belt color, setting specific goals that motivate and inspire them is part of the process. Throughout each cycle, students set goals that are meaningful to them. These goals are trackable as each student is aware that they must climb the ladder to black belt one rung at a time. Teaches Respect – Taekwondo imparts a sense that it's not necessarily what you know but what you DO with what you know that matters. Students are taught to respect parents, teachers, instructors, and teammates. During classes, students are instructed to answer, “yes sir” or “yes ma'am” and also how to show to respect their teammates by bowing before a match. Practicing Teamwork – Yes, martial arts is an individual sport however there are also many opportunities for children to learn teamwork. Sparring, board breaking, testing, demonstration performances, and tournaments all teach teamwork. Indomitable Spirit – Taekwondo students learn to maintain a positive outlook, are encouraged to keep trying, learn to believe in themselves and see each and every challenge as an opportunity to learn and grow. Mastering new techniques, perfecting kicks, keeping their hands “in guard” are all challenging skills! This consistent challenge creates a resolute spirit in students of Taekwondo. Start now! Children can begin Taekwondo from a very early age. The sooner the better to reap all the benefits awarded by practicing the art. At the school we attend, kids as young as four-years-old can go to Tiger Cubs class. As they have birthdays (and they get to break a birthday board for their birthday) they will move up to Tiger Rock Youth, then Juniors, and finally the adult classes. Ask for references from people you know. Go to local schools and ask if you can watch a class. Any school worth going to will allow spectators during class. As you are watching, notice how the children interact with the instructor. Are they showing respect? Are they well-behaved? Do the children give each other fist bumps and high fives when appropriate? Instructors should be able to do anything they ask their students to do. Do they look fit? If the instructors look like they are truly enjoying the class, that's a really good sign! A good Taekwondo school will include theory, basics, forms, self-defense, sparring, breaking, stretching, leadership skills, nutrition, and overall fitness. Students should be wearing a uniform. Traditionally, the white uniform, called a Dobok, symbolizes purity and perfection of character that Taekwondo students are expected to strive for. Hopefully, the school will also be contributing to the community in some way. Giving back is an important part of building good character. We've attended a couple of schools before we found the perfect fit for us. The school we currently attend met all my criteria (listed above) and more. At our Dojang (Taekwondo school), Tiger-Rock Martial Arts of West Knoxville, parents (and fellow students) are encouraged to fill out brag cards when they see a student doing something commendable. These “brag cards” are read aloud during class and again at the awards ceremony where students rank up. 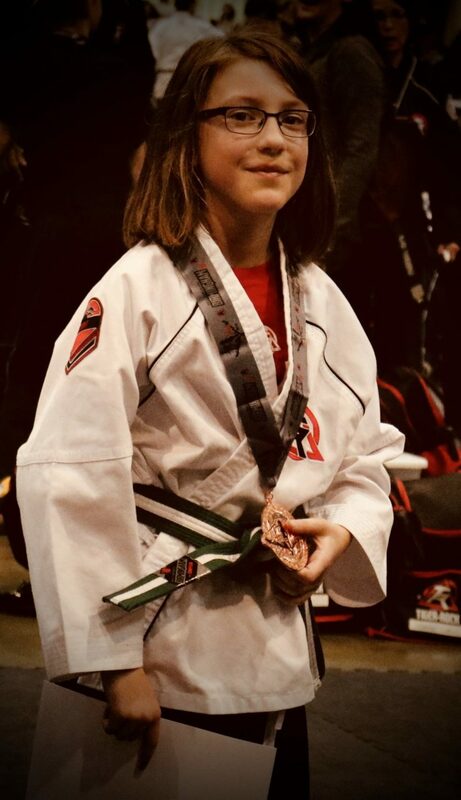 Our personal experience with Taekwondo is that it transformed our daughter from a kid who would barely look at, let alone speak to, an adult outside of our family, into a kid who will talk the ear off anyone. Not surprisingly, she is stronger, fiercer, and more confident. 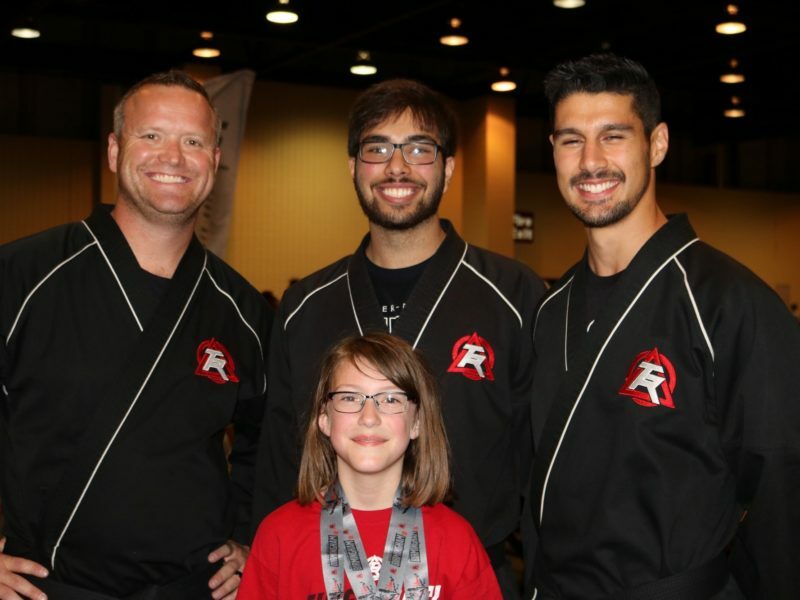 She is able to channel her energy, become even more of a helper, and a overall a more well-rounded person as a result of Taekwondo. The awards and medals hanging on the wall are a constant reminder that she can achieve success when she applies herself and that has changed her immensely. Just look at that smile, you can see the satisfaction! 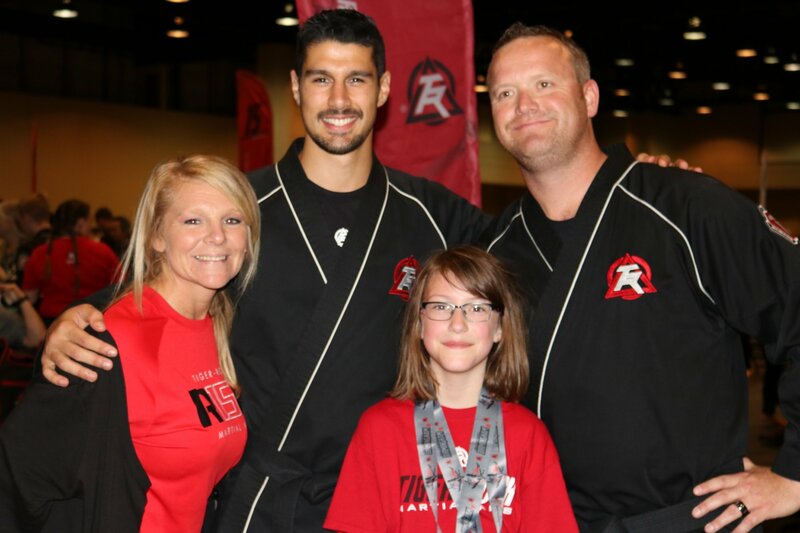 We would actually go so far as to say that participating in Taekwondo has brought our family together. Anytime the older children are in town, they go watch Shawna's class. We get together to attend tournaments and plan a mini-vacation around them. On an individual level, Taekwondo has equipped our youngest child with the fortitude necessary to live with two pesky older brothers! Taekwondo has NOT encouraged my daughter to pick fights, in fact, it has had quite the opposite effect. If she receives a challenge from her brother closest in age to her, she will accept the challenge to a friendly match. She does not treat this as an opportunity to beat up on him. I'm a proud promoter of Taekwondo, but especially the school we attend. I feel a sense of kinship, almost extended family, with the other parents. In our school, parents are welcome to stay and watch, tables and chairs are nearby where often parents are seen chatting, playing cards, working on crafts, catching up on work, etc. At Shawna's first World Tournament, we were encouraged by the owners/staff. The instructors explained what was happening, what to expect, and were cheering for her all along the way. For Shawna to receive a gold medal in board breaking and bronze in sparring at her first tournament was a huge confidence booster. As for future goals, we were able to see one of the instructors become the number one sparring champion among all adult (ages 16-34) 1st thru 3rd degree black belts with a win at World Tournament. That was incredibly inspiring. If you're looking to help your child excel in every area of life, try Taekwondo! Those who live in the Knoxville area can contact Amy or Josh Hazelip at Tiger-Rock Martial Arts of West Knoxville, and tell them ThatOrganicMom sent you. And no, I wasn't compensated in any way to write this post! We've simply seen the benefits of martial arts first hand and, you know me, if I believe in something I have to tell everyone. 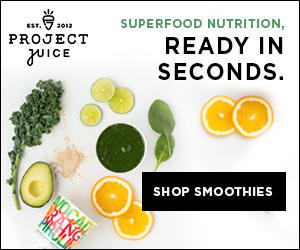 Previous Post: « Does prayer make you a healthier person? Science says yes.